If a lightweight and track-focused McLaren is what you want, then look away from this Lego 1:1 scale 720S because it is neither light nor would it hold up well in a crash. Indeed, it has no engine would be impossible to drive anyways. 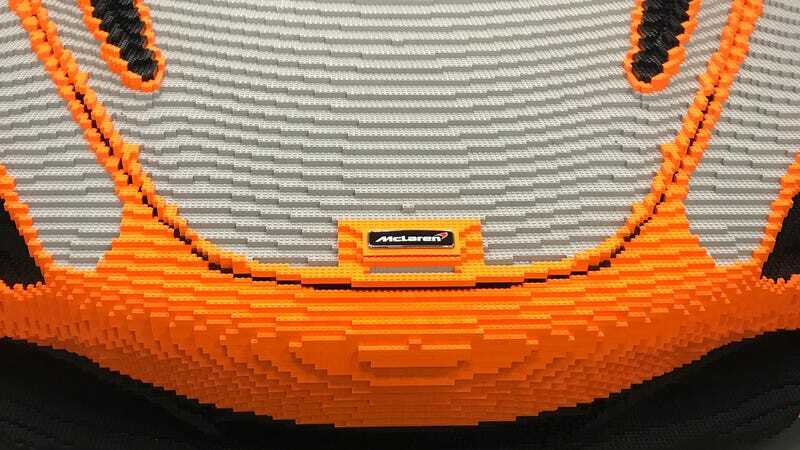 McLaren will bring the Lego 720S to the Goodwood Festival of Speed this year, uncharacteristically leaving the job unfinished: Goodwood visitors will have the opportunity to help complete the model by laying over 12,700 bricks by hand. The model is already comprised of 267,300 bricks. Once finished, the whole thing will weight 1.6 tons, or 3,200 pounds. For those of you counting, that’s about 300 pounds heavier than a normal, running 720S. Don’t worry, though—it’s not just thousands of Lego bricks supporting themselves. That would be ludicrous and structurally unsound. The model is built up around a steel frame. It’ll also come with a set of real Pirelli P Zero Corsa tires, so that’s cool. Unfortunately, the Lego 720S isn’t available to buy, so I guess you’ll just have to settle for an actual 720S instead. How boring.